This 4th of July Collection from oklahomadawn is bursting with stars and stripes. 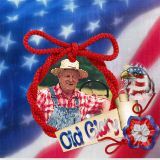 This is the perfect opportunity to show your patriotic spirit with hand made red, white & blue decorations and scrapbook pages. This Freedom Collection from sweetdigiscraps is bursting with colorful fireworks and lots of patriotic elements. 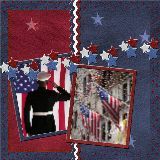 This collection is ideal to create some fantastic red, white & blue pages. 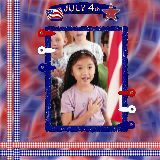 Fourth of July is always such a festive time full of fireworks and lots or patriotic events to remind us that we have so much to be thankful for. This Old Glory Collection from Candleworks is full of brilliant red, white and blue elements for your Independence Day pages. 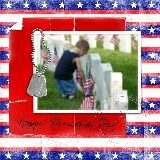 So many brave men and women give their lives every day to protect our way of life. This is a great time to honor these heroes that make the world a safer place. 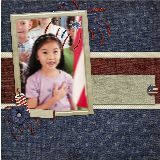 This proud & patriotic Loving Memory Collection from y2bonnie is a great way to honor the special heroes close to us. 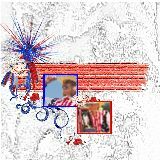 Please enjoy all the patriotic elements in this Stars and Stripes Collection from PascaleA to scrap all your fantastic Independence Day Celebrations. These red, white and blue elements will add sparkle to any page. The freedom we enjoy today and everyday is a gift to us from all the men and women who have fought for our country. It is important to remember those who have given their lives so that we may enjoy life as we know it. 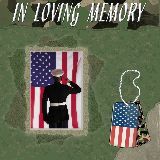 This Lost But Not Forgotten Collection from tulip_designs is a great way to honor all the heroes past and present. Although it has been several years since the attacks on September 11th , we will never forget. That is what makes our country strong. This collection from .Nayyan. is a reminder that we can make a difference when we stand together. 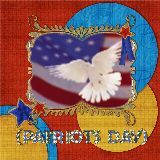 We hope you enjoy the loads of Patriotic elements in this Mega American Pride Collection from the 2MrsSumners. So, get your red, white and blue on and feel free to celebrate. Just be careful with the sparklers. Don't be afraid to show off your patriotism with this Red, White and Blue Collection from .Nayyan. All the sparkling stars and stripes are great for a Fourth of July BBQ or an Americana themed dinner party. It is always a great time to remember and be thankful all those who are currently serving or have sacrificed their lives for our freedom and safety. We all know someone who is or has served our country. This gorgeous and patriotic Home of the Brave Collection from Sooze is ideal to honor those who have sacrificed so much for the rest of us. 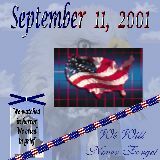 Although it has been years since the attach on September 11th , the memory is still fresh. That is what makes us strong. We will never forget. This collection from the Sumners is a reminder that we can make a difference when we work together. 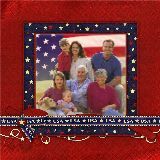 Your Independence Day Memories will blast off the page with this sparkling collection from the Sumners. Have fun with all the red, white and blue and don’t get too carried away with the sparklers. 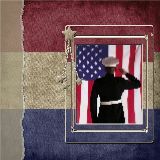 We have all known or know someone who has served their country to protect us. This Memorial Day collection from the Sumners is perfect to honor the sacrifice that they have made for us. Stars, Strips and lots of design elements in muted red white and blue. 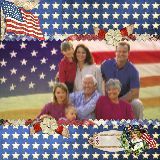 Use these variations on Old Glory to highlight and preserve the festivity and fun of your family's Independence Day celebration honoring America's birthday. Our July 4th designer collection is as exciting as a good old fashion fireworks display.